Reputed to have played host to just about every British monarch since George I, the present building is, in fact, the third incarnation of Cliveden. The first, built by the Second Duke of Buckingham in 1666, was damaged by fire in 1795 and again in 1845. Ownership has passed through several notable hands including The Earl of Orkney, Countesses of Orkney, Hugh Grosvenor (Duke of Westminster) and William Waldorf Astor. Unfortunately, the news that the latter was now in possession of the property was none-too-well received by Queen Victoria - an erstwhile regular visitor - who was ‘grieved to think of it falling into these hands’. 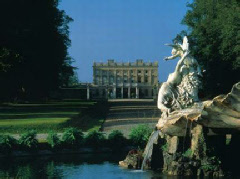 And yet when it passed to his son and wife Nancy in 1906, the “Golden Age” of Cliveden began. The hectic social scene and parties at the house attracted many of the early 20th century’s luminaries and power-brokers: Rudyard Kipling, Henry James, Charlie Chaplin, Arthur Balfour (Prime Minister), President Roosevelt, and Winston Churchill were all entertained at sumptuous parties. And George Bernard Shaw was moved to describe staying with Nancy Astor as “like Sunday with a volcano”. There was genuine scandal, however, in 1961 when Spring Cottage (in Cliveden’s grounds) was at the centre of the infamous Profumo Affair (Christine Keeler and Stephen Ward were staying here when it began). Reviews and Booking. Please note that nightsinthepast.com plays no part in the actual review, booking or reservation process for Cliveden or any other accommodation. Costs for maintaining and developing Nights in the Past are met solely by it being the last referring site to our partners which results in a completed reservation.